Wouldn’t it be wonderful if a simple, painless treatment could wash away the toxins of daily living and give your face a baby-fresh glow? Perhaps it’s time to learn about the benefits of a HydraFacial® from Wilton McLeod, DO, at Open Canvas Laser in San Luis Obispo, California, and his caring staff. Call or schedule a consultation online today with Dr. McLeod, and embark on your journey to the healthy, glowing skin you deserve with the latest in high-tech facials. The first step of HydraFacial involves cleansing and peeling off dry, dead skin with gentle exfoliation and resurfacing. Next, Dr. McLeod extracts debris from your pores with painless suction. He follows by hydrating your skin to boost its moisture and dewiness. Finally, your skin is infused with a bath of antioxidants and peptides to maximize your glow. HydraFacial works for both women and men. If you have rosacea, you may also benefit from the moisturizing and rejuvenating effects of HydraFacial. What should I expect during HydraFacial? The three-step treatment typically takes 30 minutes. Depending on your skin condition, Dr. McLeod may advise customizing your treatment to address your area of concern and maximize your results. For example, the combination of HydraFacial and Growth Factor Boost, which is made of naturally occurring proteins, can give you a more natural look by minimizing the appearance of fine lines and wrinkles. Another option is the addition of hyaluronic acid and LED lights to deliver a noninvasive, medical-grade skin resurfacing therapy in the comfort of Dr. McLeod’s office. 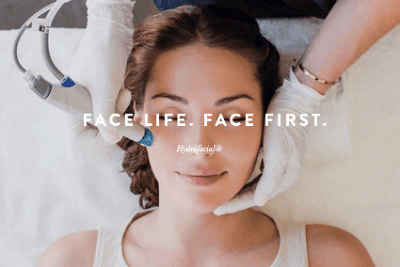 HydraFacial requires no downtime. You can get back to your day-to-day routine right away. Are you ready to take your first step toward fresh, rejuvenated skin? Call the Open Canvas Laser office or schedule an online consultation today with Dr. McLeod and find out if a HydraFacial is right for you.